The Sub-Millimeter Telescope on Mount Graham under the moonlight. Picture: Junhan Kim. On 27 March 2017 we left Radboud University to travel to Tucson, Arizona, where we were welcomed by the hot desert sun. 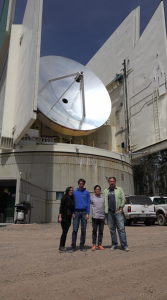 Our mission: to observe supermassive black holes at the Sub-Millimeter Telescope (SMT) on Mount Graham in Arizona. 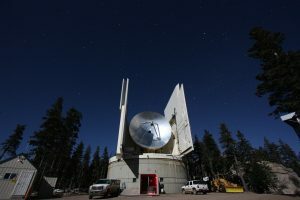 The SMT, a 10-m dish owned and operated by the Arizona Radio Observatory, is part of the Event Horizon Telescope (EHT) array, consisting of radio telescopes across the globe aiming to make the very first image of a black hole. The data taken during this observing run, which included telescopes in Spain, Mexico, Chile, Arizona, Hawaii, and the South Pole, may be good enough to get a first glimpse of a black hole event horizon. After arriving, we spent some days at the University of Arizona to work with Thomas Folkers, the SMT expert who wrote the software to e.g. retrieve and analyze the (meta)data taken at the telescope. There were still some telescope calibration issues to be worked out with him, and we had some time to enjoy the non-Dutch weather. 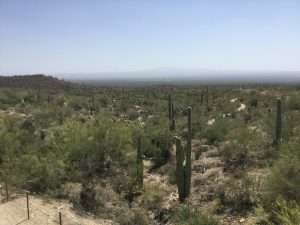 On 2 April, it was time to pack our bags, equipment, and food for two weeks to start the 4-hour drive through the desert and up Mount Graham to the SMT. Dr. Dan Marrone and Junhan Kim of the University of Arizona, who coordinated the SMT observations, drove us up the mountain. The change in scenery was quite dramatic as we drove from a desert covered with cacti to a snowy pine forest within an hour. 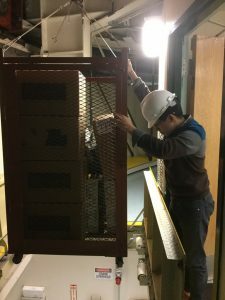 Dan and Junhan set up the hardware, and we were ready to observe on 4 April. The weather at all stations miraculously looked good, and the EHT run was a GO on the first day of the observing window. The telescope pointed automatically to the science and calibration targets according to the EHT schedule made for all telescopes, and during the gaps in between we calibrated the antenna pointing and focus, and monitored the weather and equipment status. 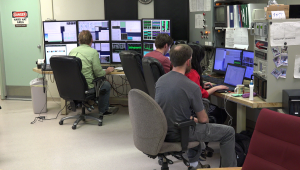 A nice feature of observing at the SMT is that the control room is on the same platform as the dish, which means that as an observer you are rotating with the telescope as it slews across the sky. The building below has the kitchen, bathroom, bedrooms and lounge, and is easy to get lost in as the stairs to the control room are at a different place every time you want to go down or up. (Part of) the SMT team. Left to right: Sara Issaoun, Freek Roelofs, Junhan Kim, Christian Holmstedt (SMT operator). Picture: Junhan Kim. We observed for three days in long shifts. The SMT has a central location in the EHT array, which means that we have mutual visibility of our science targets with Spain in the east and Hawaii in the west. We can thus track the sources over a long period of time as they move across the sky, resulting in shifts of up to 19 hours. At the same time, Dan and Junhan were also coordinating operations at the South Pole Telescope, being in constant contact with the winterover operators there. After three consecutive days of observing the weather deteriorated and we had to shut down the telescope doors to protect it from being blown off the mountain by the strong winds. We used the next two days to recharge, and when the weather improved again went back to observing for the last two days of the run. Things were running quite smoothly at our telescope, and we had relatively few problems. There were some worries when we saw the atmospheric opacity rise strongly sometimes, but we discovered that at those times our tipping radiometer was not pointing at the sky, but at the neighboring Large Binocular Telescope, which was in the way and corrupting our opacity measurements. Sometimes the black holes we wanted to observe were also hiding between the trees and (endangered!) mountain squirrels, so getting a strong signal from the data at very low elevations will be challenging. In the SMT control room. Left to right: Christian Holmstedt, Freek Roelofs, Sara Issaoun, Dan Marrone. Picture: Junhan Kim. Jupiter and the full Moon from the platform above the SMT dish. Picture: Junhan Kim. During the hours in which everything was going well, we kept ourselves busy with various other activities. One of them was the EHT Beauty Contest, a competition set up by Heino Falcke for taking the best observing picture, which led to an impressive image collection from all observatories. Our submission is shown to the right. 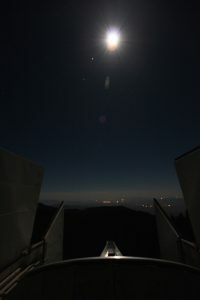 It shows Jupiter and the full Moon as seen from the platform above the SMT dish, with the city lights from the valley in between. Telescope operator Bob Moulton suggested taking a picture from this unusual viewpoint, and Junhan bravely climbed the ladder to take it during a gap in the schedule. We also kept ourselves awake at night by chatting with the people of the central coordination team in Cambridge, MA via their camera connection. This team was overseeing the entire operation, and could contact and, if necessary, wake up experts on particular issues if something went wrong at one of the telescopes. We joined in on one of their selfies during the shift change. 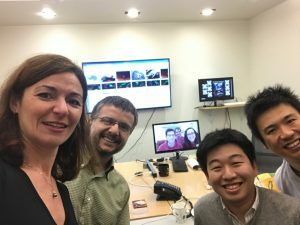 Left to right: central coordination morning shift Feryal Özel and Dimitrios Psaltis taking over, SMT observers Junhan Kim, Freek Roelofs, and Sara Issaoun, and central coordination night shift Kazu Akiyama and Hotaka Shiokawa. Picture: Feryal Özel. Junhan bringing down the hard drives from the receiver room. When the run was over, we did some extra calibration measurements, packed up our precious hard drives with the data, and drove down the mountain again to spend some more days in Tucson before travelling back to Nijmegen. While in Tucson, we were already thinking of next year’s campaign and worked with Tom Folkers to improve the SMT software based on what we had learned during this run. It was an intense but fun week, and we are looking forward to seeing a black hole shadow emerging from the data!